If you haven’t started already, I am sure you will soon be decorating for Christmas. For most of us the focal point in the room is the tree. There is no right or wrong way to decorate a Christmas tree, but I follow some basics steps on every tree I put up. I hope these decorating tips will be helpful to you. I always sit my tree on a towel, so that it is easy to move around if needed. I begin by fluffing and shaping the tree. If you use a real tree you can skip this step and just turn the best side forward. A pre-lit tree can be wonderful as long as the lights work. I prefer a tree without lights. If a string of lights goes bad you can easily replace them. It also allows you to change out the color and type of light from season to season. Put the lights on the tree starting at the back center next to the trunk. Begin weaving the lights down one side of the branch, over the front and back the other side of the branch. Continue in the same manner going from branch to branch working to the top of the tree. Check to see how many strings of lights you can connect together. You might want to run an extension cord with multiple outlets, up the center of your tree. If you put your lights on section by section, you can leave them on for storage. It gives you the advantage of the pre-lit tree without the hassle and expense. Once the lights are on the tree I begin trimming the tree from the inside out. 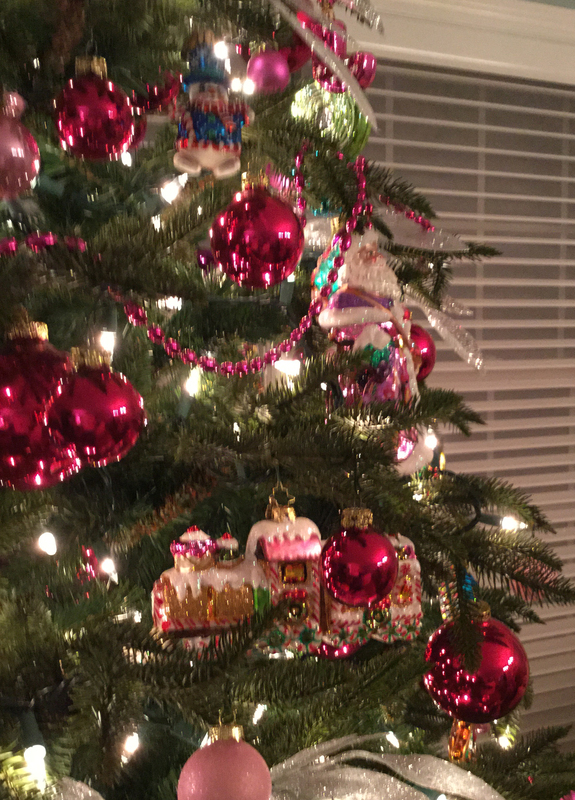 I like to place the ornaments in the center of the tree. I usually use larger ornaments in the center and I like to use ones that reflect light. I then start placing my favorite or feature ornaments on the outside edges of the tree. These are your favorite ornaments that you want everyone to enjoy seeing. I now fill in the tree with more ornaments, mostly medium size. I like to put some on the outside and also place them in the tree at different levels. I like to use different size balls on my tree. Then I like to add the final detail, this could be silks, garland, smaller balls, ribbon. This is what really makes your tree, it is the icing on the cake. On the top of your tree you can add a topper, ribbons and/or add additional silks. On the tree I add a few stems going upward and then started laying them out and down. I always have more on the top of the tree. Take some time to look at your tree and make any needed adjustments. Keep trying things until you get your tree the way you like it. If you would like to see more pictures as I decorate my home, like my business page on Facebook. I will be adding updates there. Hi Jane…this is the type of post I was asking about in my last email. It looks like it is shared from WordPress. Love your posts and your creativity! Thank you Linda. What you do is link your blog to Facebook. Go into WP Admin, settings, sharing. Then click on the app you want to share with. For this I clicked on Facebook, and if you have more than one account you can pick the one to share your post with. Then save the settings at the bottom of the page. In the future every post will automatically be shared on Facebook. For some reason every now and then you will loose the connection and have to go back and reconnect yourself. Hope this helps you, I will be glad to walk you through the sets. Beautifully done….cannot wait to see more! Thank you Amy, getting your house decorated puts you in the festive spirit.